Yesterday, I tested a tiny USB microphone for E.V.E, and managed to recognized the recorded sentence with the help of the wit.ai platform (even though the quality of the microphone was a little poor). Let’s get a little deeper into wit.ai and see how it could be helpful for E.V.E. 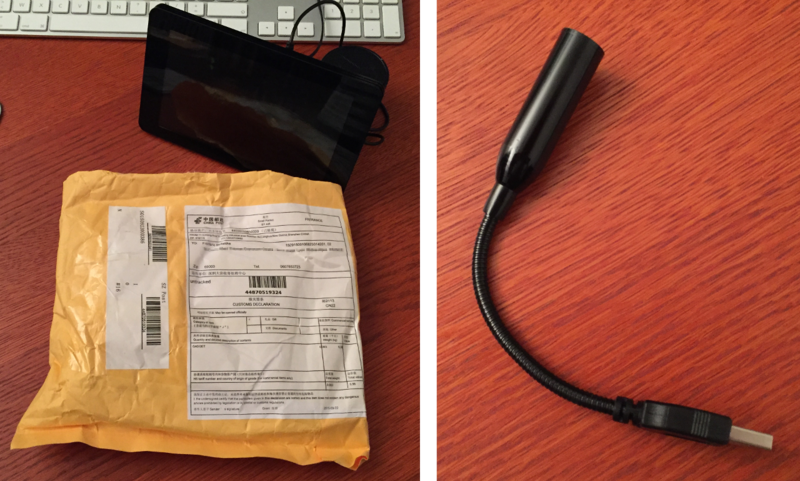 I received this morning the second USB microphone I ordered on www.dx.com. It’s a little more expensive (5.33 €), but still very cheap for experimentation purposes. It’s a lot bigger than the tiny one I used yesterday. It is flexible too. 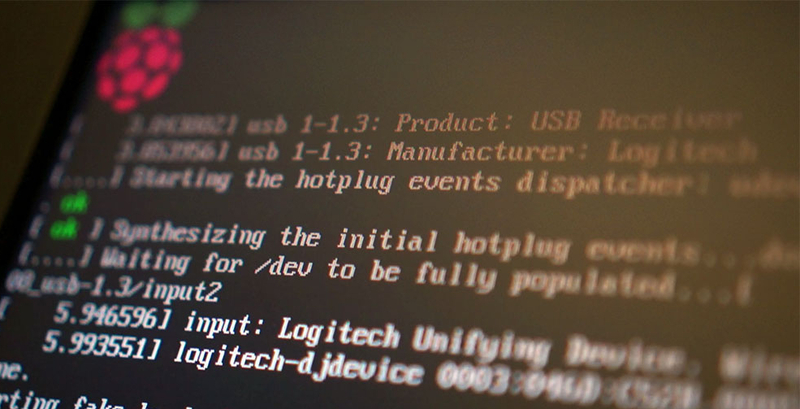 Once connected, it will face the user (contrary to the other one which is stuck in the back of E.V.E). 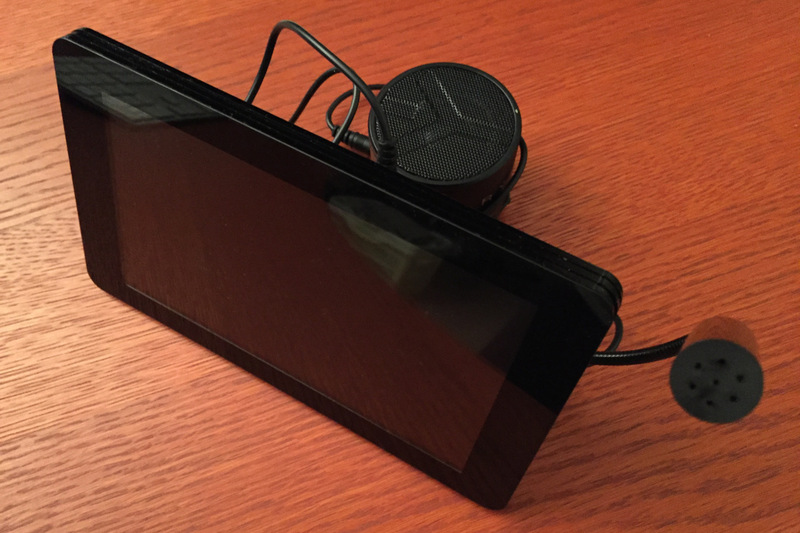 Hopefully, it’ll provide better inputs for voice recognition. E.V.E is now looking a little funky, with some kind of ear pointing out on her left side. Some kind of old-style hearing aid. But I guess it’s still ok. After all, it’s a prototype. I’ll see if I keep this microphone or the tiny one later on. 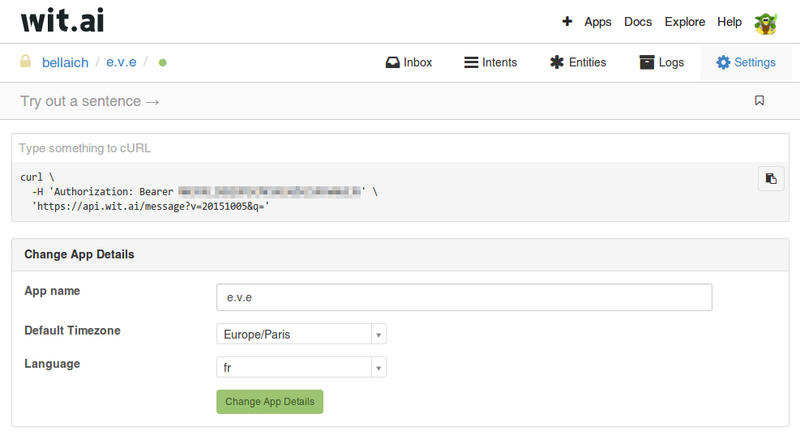 It gave me a new Access Token (blurred in the previous screenshot). I changed yesterday’s recognition script accordingly. Just like yesterday, it gave me back the interpreted meaning of the record ("_text" : "quelle heure est-il"). 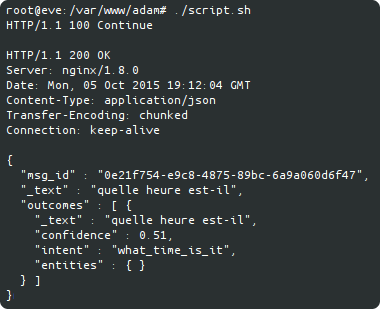 But this time, it gave me also a confidence level (0.51) and the recognized intent ("intent" : "what_time_is_it"). 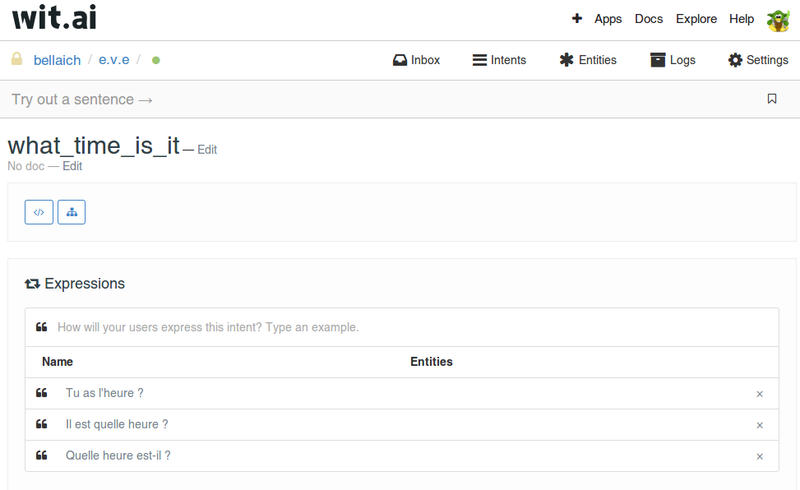 From there, you can then create the necessary intents from the collected expressions in your Inbox (or find other intents from the community). From the Inbox, you can also train your intents (by mean of validation or correction). And wit.ai will get better at understanding things. An intent like “What time is it ?” is easy to manage. There might be several expressions corresponding to the same intent (telling what time it is), but it is easily managed by associating different expressions to the same intent. Now, if the user says “Wake me up tomorrow at 5 am” or “Set the alarm to 5 am”, this adds another level of complexity. In addition to determining the user intent, wit.ai tries to capture and normalize these entities for you (if you ask for it). 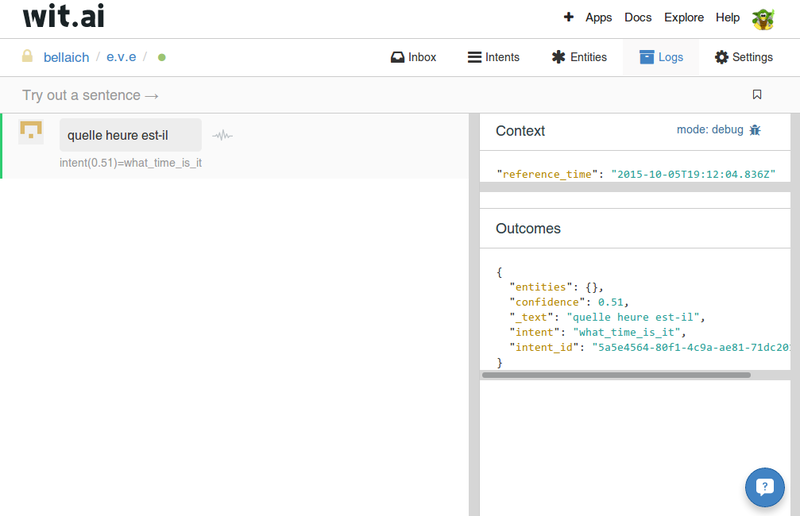 You’ll get your entities back in wit.ai JSON result. As you see in the lights example above, an entity value is not necessarily tied to a specific phrase in the sentence. on_off = off is inferred from the sentence as a whole, unlike temperature, which is inferred from the 68°F phrase in the sentence. This really looks good. 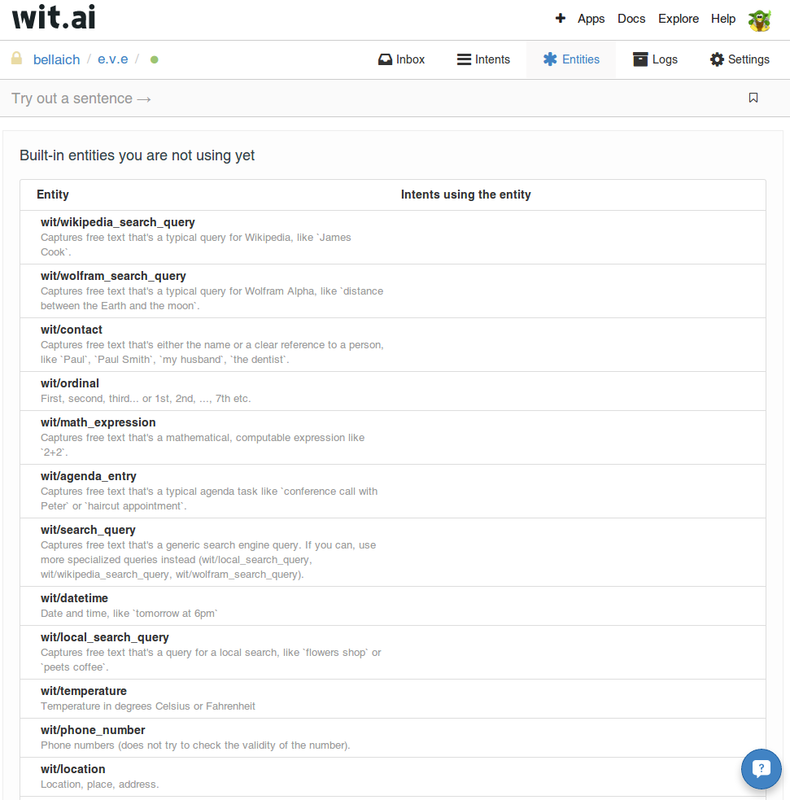 I think I’m about to set my mind and select wit.ai for E.V.E voice recognition.